Many years ago, I had the chance to visit a lacquerware factory when visiting Vietnam. I saw first-hand how Vietnamese lacquerware was made, and I was told that the best way to get the high glossy shine associated with good quality lacquerware, was to polish the products by hand. No machine could measure up to the shine and sheen that could only be brought forth by hand. Which explains why high quality lacquer ware is expensive, and due to the materials used and effort and skills, lacquerware is primarily decorative these days instead of used for practical purposes. But it is that glossy shine of a high quality lacquer product that inspired Shu Uemura’s Laque Supreme lip colours. Inspired by Japanese lacquerware, Shu Uemura offers a lip colour that is lightweight, glossy, shiny and pigmented. I like the black tubes it comes in, because that is very in keeping with the theme, and there is a nice window of colour so you know which ones you have. I won’t classify these as lip glosses. They are much more pigmented, so I’d place them in the category of liquid lipstick, but the liquid texture allows you to dial back on colour and pigment as you see fit. Since I love lip colours, how do you think these fared for me? I can tell you that a quick online search will yield you mostly raves; that this is the best thing since sliced bread! 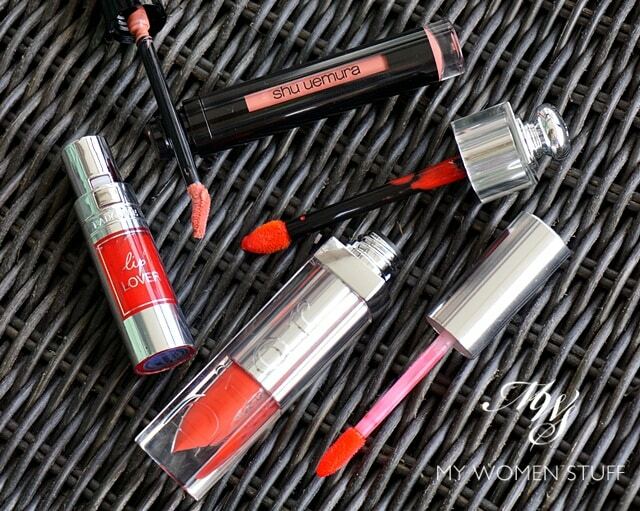 Well, let me just say that if you like using liquid lipsticks or lip glosses, and like products like Lancome’s Lip Lover or Dior Addict Fluid Stick then you will like these. Like what you get from Dior, these Laque Supreme lip colours from Shu Uemura are huge on colour. 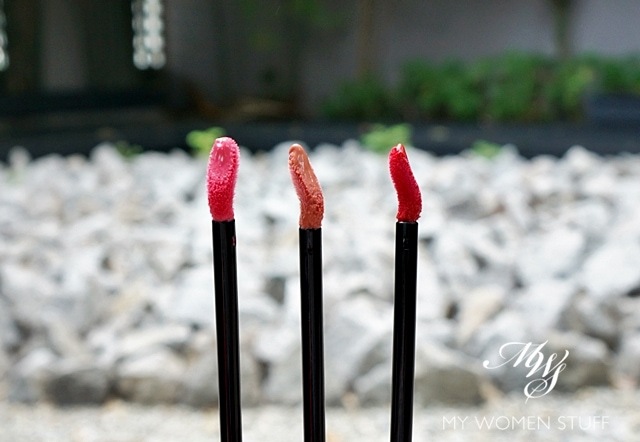 They are incredibly pigmented and give you a lovely glossy lip on top of the colour you get. It’s like lipglosses on steroids. The doe foot sponge tipped wand is an innovative design that fits your lip and holds colour well, so you don’t have to double dip. I do find that wiping off some of the colour as you remove the wand out of the tube allows you better control when applying it to your lips. Otherwise, it can get a little goopy. I also find that layering on thin layers of product gives you better longevity and depth of colour, as opposed to applying it in one thick swipe of product. The pigment is strong, so you can easily gauge the depth of colour you need based on your comfort level. 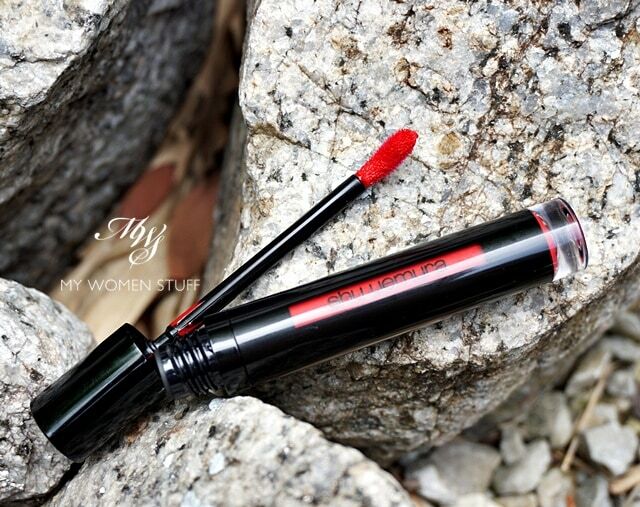 The texture is a lightweight, water based texture that does not feel heavy nor goopy on your lips, and the colour is fairly long lasting once applied. I received 3 colours a few months ago, so here are the swatches on arm, on lips and in a quick FOTD so you have an idea of what they look like when worn. PK01 – A bright pink that is fresh and refreshing, and is pretty flattering for those with fair or light skintones. RD02 – A straight red with slightly warm base that is punchy and pretty much in your face! This has the most opaque texture among the 3 featured. You may notice how in the arm swatches, the middle looks fairly sheer. I noticed that when swatching on my arm, but for some reason, when you do the same swatch on your lips, you get a much stronger tone. I think it’s to do with the wand. The curve hugs your lips just right, and deposits just the right amount of colour. All the lip swatches were done with 2 thin layers of product. You see a nice shine, but it isn’t super glossy to the extent of being greasy, like you just ate a bowl of oily laksa or dug into a box of fried chicken. It gives your lips a nice, flattering shine. I’ve got the same lip swatches in a simple FOTD to show you just how it looks in a full face of makeup. I thought it interesting that BG01 was fairly flattering for me. It would be nice to dig this out for a simple swipe of colour without having to be too careful about whether I colour in the lines, the same way I have to be for RD02. 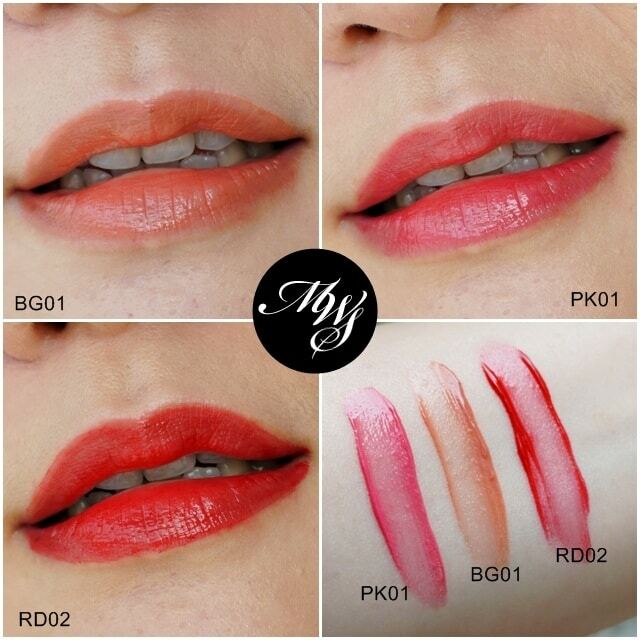 BG01 was also more sheer than RD02 with PK01 falling somewhere in the middle. It appears to be true that the deeper the shade, the more opaque it is in one swipe and vice versa. Also, if you are the type who hates how products like these can fade and leave a weird ring around your lips, fear not. I find that they have a slight stain effect, so as the colour wears off, it leaves behind a nice stain of colour on your lips that makes it easy to touch up. However, as much as I love the intensity of colour, I’m not crazy about the Laque Supremes. They aren’t as tacky as Dior Addict Fluid Sticks and yet have the same beautiful intensity of colour and shine. But there is a strange chemical scent that I can’t get over. The Shu Uemura Lacque Supreme liquid lip colours have a lovely lightweight texture and an incredible intensity of colour. I suggest using thin layers to build up the colour as it looks best that way, and you can build them up from sheer to opaque in just about 2 layers. The product also operates as a stain so you get good longevity as well. All in all, as a lip colour, it’s an amazing product. However, I find that there is a chemical scent to them that I’m not crazy about so as a result, I can’t say I’m a fan. Have you tried these Laque Supreme lip colours? Are you a fan of liquid lipsticks? Disclosure: Featured products were press samples for consideration. Our commitment is to honesty and fairness. For posting guidelines please read the disclaimer. NEXT POST: Your Say: How are rising prices of beauty products affecting your beauty spending habits? Thank you Lyn 🙂 I made the same goopy mistake the first time so I knew I had to work with thin layers. Good to know you didn’t notice a scent coz it might just be me! Hi Paris! Great review! I find BG01 a very interesting color! Although, I would have never picked this up for myself but I like it a lot on you. So proly I will buy this when I get a chance. Well, my sense of smell is kinda my superpower now as I can smell anything, i’ve been like this since pregnancy lol. Yup! We can get it at Holt’s and some Sephora locations 🙂 I haven’t seen these yet, but I know they’re going to be available here soon! You look great in all the colours! Although I don’t use lip products except lip balms, I find that those solid lipsticks sometimes can make lips look quite flat and ageing. I don’t know why though, maybe it’s because some people don’t use it from the bullet? Not sure.. it just looks that way to me. Whereas, like you said, liquid lipsticks have that gloss-from-within (is that even a word haha) quality which makes it look so much better. But ultimately, personal preferences haha. Chemical scent? I won’t even go near it. Ooh yes Shiseido’s liquid lipsticks are amazing! I love them too (totally forgot about them although I have one in my daily pouch at all times! LOL) and you’re also right about Guerlain’s. Lovely, but gosh, with all the crazy prices around now, I’m being very very careful with my money especially with Guerlain. Their prices are now stratospheric! That red shade is gorgeous! Not sure about the scent though. I’ll have to smell it before deciding if I can put up with it. You know Gio, I don’t read many or any complaints about it, so I think I’m just being very sensitive. Give it a go when you have the chance. The shades are lovely! Hi Paris, I’m glad that I’m not the only one that faces this issue. The smells, really dunno how to describe it. Like the textures and the colors on me but the smells made me but the lipstick aside at the moment. So sad of the smell…. Gosh Sharon, someone who agrees with me about the scent! I was actually quite surprised that no one mentioned it. Was just wondering if I was just being too sensitive. The colours are lovely otherwise though, right? Now i have to find out what radioactive smells like. LOL. I am not sure why, for the dior gloss with the little brush wand, i always have problem applying them evenly. so i get some funny blanks on my lips. as much as i like the colors, i had to stop using it cause i just can’t get the application right. LOL!!! Maybe the air in Tokyo? 😛 Eh you know, I actually really like the brush in Dior glosses. I always found it easier to use than a sponge wand. But I know a lot of people don’t like it coz they say it’s hard to control. But because Dior glosses are the only glosses I’ll wear, I’m glad they work for me! PK01 looks really nice on you. Good for everyday look. I think it kind of brightens up your look too. Thanks! It’s definitely an everyday shade and kinda cute too! Very pretty! I’ll see if the scent bothers me.